The bumpy track surface of the Singapore streets -even though it had been cleaned the night before - was dirty, slippery and dusty as the first practice session got underway. Throughout the 90 minutes, therefore, the green track evolved as the F1 cars cleaned it up, and the lap times dropped accordingly. Until, that is, the tires started to get worn. Daniel Ricciardo ended up fastest at the end of the hot and slippery FP1. The line-up for the weekend was: Mercedes - Lewis Hamilton and Valtteri Bottas; Ferrari - Sebastian Vettel and Kimi Raikkonen; Red Bull TAG Heuer - Ricciardo and Max Verstappen; Racing Point Force India Mercedes - Sergio Perez and Esteban Ocon; Williams Mercedes -Lance Stroll and Sergey Sirotkin; Renault - Nico Hulkenberg and Carlos Sainz; Toro Rosso Honda - Brendon Hartley and Pierre Gasly; Haas Ferrari - Romain Grosjean and Kevin Magnussen; McLaren Renault - Fernando Alonso and Stoffel Vandoorne; Sauber Ferrari - Marcus Ericsson and Charles Leclerc. Ericsson was the first out on the 3.14-mile (5.063 km) 23-turn street circuit on a hot and humid afternoon. The ambient temperature at the start of the 90-minute session was 88 degrees Fahrenheit (31 degrees Centigrade) and the track temperature was 109 degrees Fahrenheit (43 degrees Centigrade). "The circuit itself is very physical and puts a lot of strain on the body," Hulkenberg said. "It's up there as one of the toughest circuits of the season. It's a long lap with corners coming thick and fast, with not many straights to have a break. The humidity makes it hard combined with all the action we're doing at the wheel with non-stop corner combinations and frequent gear changes." Pirelli's slick tire compounds for the weekend were the soft, ultra soft and hyper soft. Stroll had an early spin in Turn 2. Not all the drivers, therefore, were keen to do a lot of laps early on. But among the exceptions were the Sauber-bound Raikkonen who clocked a 1:44.622. Such was the evolution of the green track that Bottas soon beat that with a 1:43.428 and then a 1:42.474 on the ultra soft Pirellis. He followed that with a spin at Turn 2. As the half hour mark approached Hamilton used the ultras to post a 1:42.072. 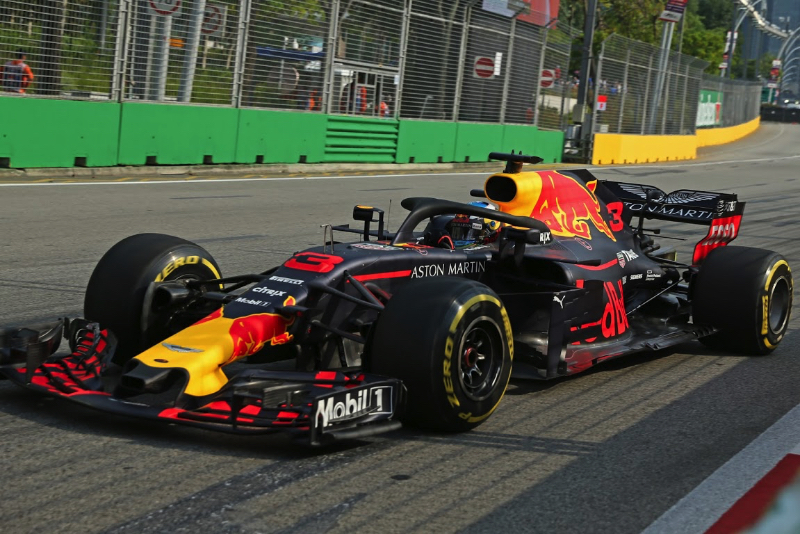 Next, while Verstappen was complaining about his brakes and steering, his teammate Ricciardo turned a 1:41.814 on the soft rubber. The top 10 at the 40-minute break were: Ricciardo, Bottas, Hamilton, Verstappen, Perez, Hulkenberg, Vettel, Ocon, Sainz and Alonso. Bottas quickly changed that on a set of softs as he posted a 1:41.669. The track got faster, and with just under 30 minutes to go Vettel broke the one minute 40 second barrier with a lap in 1:39.997 on the ultra soft Pirellis. Verstappen moved into second while Raikkonen was third. Vettel didn't stay on top for long, however, as Ricciardo got his Red Bull around in 1:39.711 on the hyper soft compound slicks. It was still slippery, and Raikkonen and Bottas both had to use the escape roads. In the final 20 minutes the drivers circulated on worn tires and therefore nobody would top Ricciardo's best. Neither Mercedes driver, however, used the hyper softs in the session. And the track was still slick. Leclerc clipped the wall and ripped the right front suspension of his Sauber. "Sorry guys, my fault," the Sauber driver radioed. The top 10 at the end of FP1 were: Ricciardo, Verstappen, Vettel, Raikkonen, Hulkenberg, Hamilton, Sainz, Bottas, Leclerc and Grosjean. But that order would change as the green track would continue to evolve throughout the weekend.